Our Full-Color Tent is printed in full-color over the entire tent. Push buttons make it easy to set-up. Each tent comes with a wheeled carrying case and stake kit. Prices range from $1506.00 to $1246.00 each. 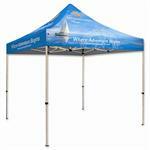 Our Full-Color Tent is printed in full-color in one location. Push buttons make it easy to set-up. Each tent comes with a wheeled carrying case and stake kit. Prices range from $615.00 to $490.00 each. 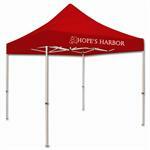 Our Full-Color Tent is printed in full-color in five locations. Push buttons make it easy to set-up. Each tent comes with a wheeled carrying case and stake kit. Prices range from $969.00 to $775.00 each.